About fifteen miles to the south of Martha’s Vineyard, we are about to see a revolution in New England energy production. There, spread over an area about half the size of Rhode Island, three multinational partnerships with leases to wind energy areas (WEAs) are moving ever closer to beginning construction on approximately 336 towers combined, with the potential for hundreds more. Depending on size and efficiency, the initial turbines could generate roughly the same amount of energy produced by an average-capacity nuclear power plant, or enough to power roughly one million homes, and the most optimistic estimates are that the offshore wind potential for the state is more than nineteen times the total current electricity consumption. In other words, this is not your grandfather’s backyard windmill. Nor, apparently, is it another Cape Wind, the now moribund plan to put wind turbines in Nantucket Sound. 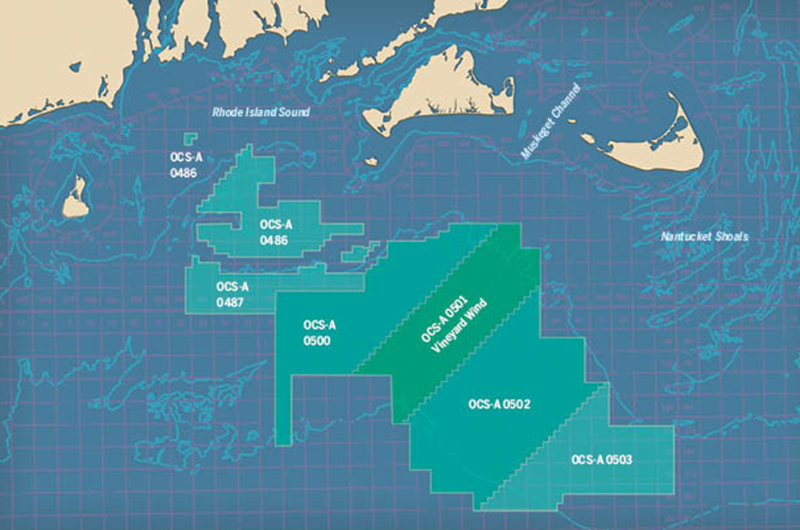 With the Commonwealth of Massachusetts awarding the first contracts to buy some of the power generated to Vineyard Wind, the consortium with the closest ties to the Island, the question about industrial-scale wind development south of the Island no longer seems to be one of if but when. And the answer is soon, with construction on track to begin in 2019 and the first turbines expected to be online several years after. Some think that it is about time for the U.S. energy industry to embrace this evolving technology that has the potential to make a real dent in efforts to combat climate change. Others think that it is a fool’s errand and will produce expensive energy that has to be subsidized by taxpayers and ratepayers. Some say that the wind “farms” should really be called bird-killing industrial zones. Still others are scared that if they are excluded from dragging fishing nets (trawling) in the WEAs, it will mean the end of their livelihood as commercial fishermen. To some extent, all are right, and to some extent, many of the answers are unknown. But whatever big wind’s ultimate impact on energy prices and power supplies turns out to be, and whatever aesthetic and environmental impacts above the water come to pass from the construction and maintenance of hundreds of skyscraper-sized turbines, one thing can be said with relative certainty about the plans to develop offshore wind energy: like an iceberg, most of the story will be below the surface. Here with the wind: The offshore lease areas south of Martha’s Vineyard will eventually be home to many hundreds of giant turbines. After all, think about a roughly 600-foot-tall tower. Add three 400-foot-long blades plus an eight- to twelve-megawatt turbine engineered to withstand hurricane force winds. Now imagine the incredible amount of torque and tension that has to be countered by the structure that anchors it all below the ocean floor. Turbines of the scale being proposed can be mounted on multiple-legged towers or on single-legged “monopoles,” and the style or mix of styles that will be used in our waters is yet to be determined. But all of the developers will begin by drilling hundreds of exploratory holes to understand the soil and hard sediment at each site, making adjustments in placement as needed. Then they will pile drive the massive supports – as much as thirty-two feet wide for monopoles, somewhat narrower for multi-leg – roughly 150 feet into the ocean floor. Despite the enormous size of the supports, their actual footprint on the seafloor will be relatively modest. Of greater ecological concern is the noise generated by driving them into the ground. Most marine fauna are very sensitive to sound, or more specifically, vibration. Fish sense vibration in varying degrees through what are called lateral lines and use the information to seek potential prey as well as to avoid potential predators. Marine mammals, meanwhile, have ears that are designed to hear underwater. Since water is denser than air, sound travels through it very easily, and as a result it moves five times faster than through the air and across relatively greater distances. The noise generated from driving hundreds of titanic piles during construction will almost certainly result in a decreased level of finfish and marine mammals in the area surrounding construction. According to Captain Rick Bellavance, president of the Rhode Island Party and Charter Boat Association, the construction of the much smaller wind farm that went into operation off of Block Island two years ago had a notable impact on fishing there. “The construction phase will be problematic,” he said at a conference on lessons learned from the Block Island process last winter at the University of Rhode Island. “Fish definitely stopped biting during the pile-driving. Other evidence also suggests the impact of noise on finfish might be temporary. Underwater observation by the Florida Fish and Wildlife Conservation Commission has shown that after the staged sinking of ships with explosives to build artificial reefs, fish aggregate almost immediately as the ship hits bottom. Another study conducted in Europe specifically on the effects of pile driving for wind farms found that while there was “a relatively large zone of behavioral response” by fish, there was indication that some fish may become habituated to the sound. 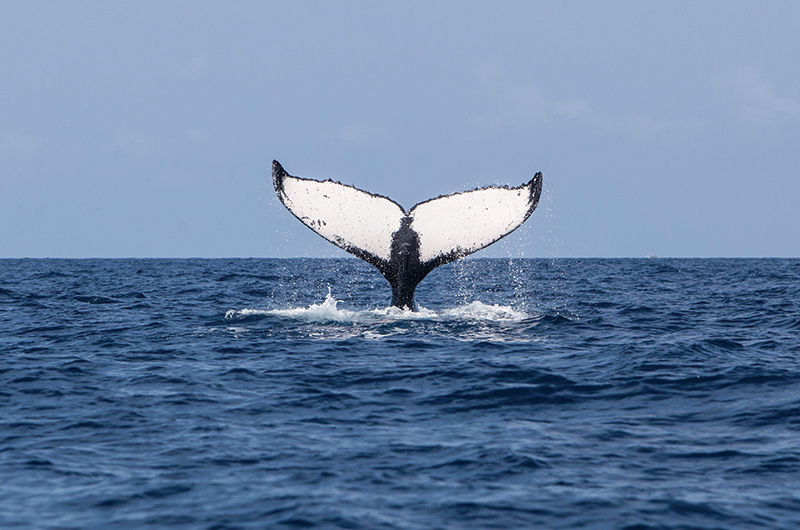 Less is known about the impact of noise over a prolonged period on the migration and feeding of marine mammals, and in particular on whales and other cetaceans for whom underwater sound is important for communication. “There has been a lot of research in Europe in particular on impacts on cetaceans during construction,” said Sofie Van Parijs, Northeast Fisheries Science Center’s senior scientist and leader of the Passive Acoustics Research Group. “There is published evidence that they do move farther afield during pile driving and show changes in activity level and possibly abundance.” But, she warned, most of the European research has been on smaller harbor porpoises and dolphins. “We have a much larger number of cetaceans compared to Europe, and in addition we have some very different hearing specialists, such as large baleen whales that communicate and hear best at low frequencies, very much in the range of pile driving.” If the forage base is impacted in the area, she pointed out, the effect will trickle up the disrupted food chain. Other than noise, the primary impact of the construction phase is likely to be the disturbance of the seafloor ecology and the resultant stirring up of sediments into the water column. After the towers are constructed, they need to be connected via a grid of subsea cables to sub-stations in the WEAs where the power generated at each tower is collected and reconfigured for transmission ashore. To protect the cables from the possible impacts of storm-induced high currents or interaction with fishing gear, they will be buried in the seabed. The intent is to bury them at least six feet below the ocean floor, though some areas will be deeper and some will be shallower. This will cause disruption of the benthic habitat in the path of the cable trenching, but over time the currents, normal and storm induced, should smooth out the bottom disruption. The transmission cables to shore, which will carry the power generated from all of the WEAs, will likely run across Rhode Island Sound and the mouth of Buzzards Bay and up the Sakonnet River to the site of the old Brayton Point power plant. (An alternative route would run up Vineyard Sound to Falmouth.) Because of the distance involved, the construction phase for burying this cable will disturb a lot of benthic habitat. However, it will not be the first subsea cable to cross this area, and there is no known negative impact from the existing cables, which bring power to the Vineyard and Nantucket. Ironically, perhaps, part of the concern is not that otherwise pristine seafloor areas will be disturbed, but the opposite. Some of the WEAs are adjacent to ocean dumps where contaminated spoils have been deposited for years. Other areas contain unexploded ordnance, which poses a problem mainly for the construction crews. It’s also well documented that, either for safety purposes or because a tugboat operator was anxious to get back to port, spoil loads have been short-dumped many times in the area. The upshot is that construction may re-suspend in the water column some of the contaminants that have remained on the bottom for years. Also, silting needs to be considered in the correct context: commercial fishermen have been trawling many of the areas in question with scallop dredges and other forms of bottom tending gear, which routinely disturb the surface of the sea floor. Indeed, most research about the effects of sedimentation is focused on areas highly impacted by fishing gear. The swaths of ocean south of the Vineyard that have been leased for big wind differ from the areas in Europe that have already been developed for wind in various ways: the seafloor here is more contoured, the species more varied, the winds potentially stronger. Nonetheless, the experience in the European WEAs gives reason to be optimistic about the long-term impact of construction, particularly for finfish. “The construction and operation of offshore wind farms do have some environmental impact, such as disruption of the seabed and noise pollution, but many of these impacts are to a lesser extent than originally predicted,” concluded Jennifer Claire Wilson of the University of Hull in her study Offshore Wind Farms: Their Impacts, and Potential Habitat Gains as Artificial Reefs, in Particular for Fish. “Through careful design of the required scour protection, new habitats can actually be created, which may be beneficial not only to the surrounding ecosystems and environment, but also potentially to local fishermen,” she wrote. 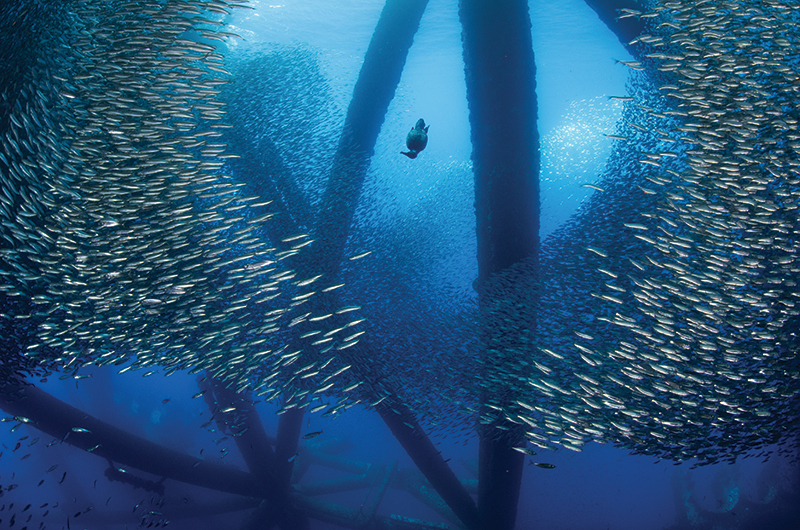 You hear it often: the towers will create artificial reefs around which fish will thrive. Because currents swirling around a new structure on the ocean floor will scour out sediment, the builders of wind farms put a combination of riprap and sediment mats around the bases of the towers, out to a sixty-foot radius on monopoles. These rock piles, along with the subsurface tower itself, form hard structures in areas that are otherwise generally flat and featureless. Each of these will in turn form a small ecosystem, with benthic flora such as green, brown, and red algae starting the colonization process, followed by a variety of barnacles. Eventually crustaceans will take up residence. The result of all this hard structure growth could be a major fish attraction. Anyone who has spent time around the oil rig structures in the Gulf of Mexico has seen what amazing fish attractors they are. Each tower becomes an ecosystem that, besides attracting transient finfish, provides a new spawning habitat for some species. The Gulf of Mexico is a subtropical climate versus a temperate zone climate here in New England, but it’s well known that natural and man-made hard structure features on the ocean floor in New England attract sea life. These towers should be no different. Experts hope the structures will support vibrant ecosystems, such as those that have developed around oil rigs in the Gulf of Mexico. That said, there would be ongoing impacts to the underwater environment even after construction of the towers is completed. Some are concerned that the level of current disruption in the area of the turbine bases could impact the development of larvae from animals that spawn in the area, such as loligo squid. But since the towers will be placed a half-mile to three quarters of a mile apart, wholesale current changes for the area are unlikely. The rotating blades of the turbines will also generate noise: a whaahuuump sound as a blade goes through different air densities. Generally the noise is about 55 decibels at a distance of 300 feet. For comparison, a lawn mower is 90 decibels. While there are no studies specifically looking at either of these issues, once again the operational experience of the European wind farms has not proven them to be a problem. marketed to repel sharks. A United Kingdom study, EMF-Sensitive Fish Response to EM Emissions from Sub-Sea Electricity Cables of the Type Used by the Offshore Renewable Energy Industry, looked at behavioral reactions of certain sharks and rays to EMF in a large sea pen and concluded that although some fish appear to respond to EMF, no positive or negative effects could be determined. Studies have shown that the highest impact from EMF is directly above a submerged cable, and that the field dissipates fairly quickly on either side horizontally as well as vertically up the water column. A fish swimming near the surface in 100 feet of water will experience little or no effect. Anything on the bottom will get the maximum impact for a short horizontal distance. 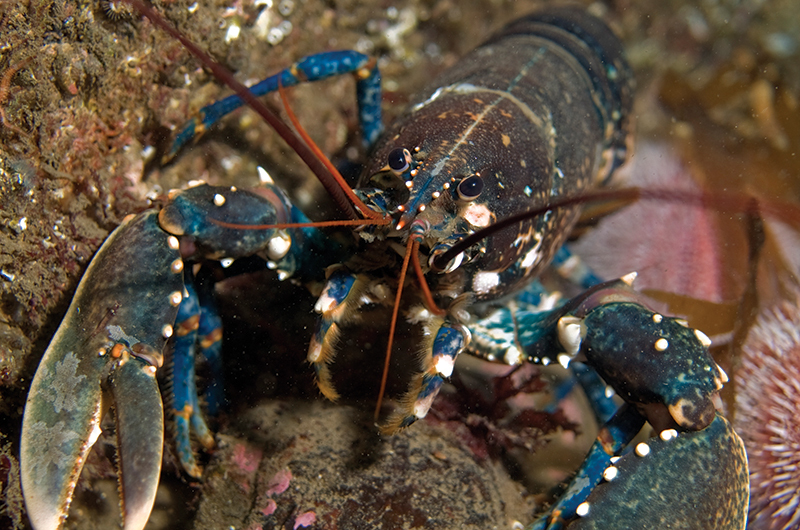 Bottom-dwelling crustaceans such as lobsters and crabs therefore might be affected by these fields, as they will continually be the closest to the cables and tend to move slower than finfish. The important question, of course, is whether EMF created by the trans-mission cables forms an impenetrable barrier for them and other species such as finfish. A recent University of Rhode Island study determined EMF would have no significant effect on lobster migration, which is a positive considering that the species is currently experiencing a decline in southern New England. It’s worth remembering, however, that the decline of the lobster in southern waters is thought to be due at least in part to the changing climate caused by burning fossil fuels. As is the destruction of coastal wetlands from sea level rise. And the calamitous collapse of coral reefs globally. And the potential thinning of crustacean shells due to acidification. And on and on. Those impacts are real and ongoing, which is one reason why even groups that might be expected to be most hesitant to embrace the construction of the wind farms remain open to accepting some disruption. And though the towers will put some areas off limits to trawling, if they do produce an abundance of marine resources, Pappalardo knows that more than likely fishermen will figure out how to catch and land them. That is what they have done for many, many years. This will be no different.